Not much is known about this 8-armed creature. It is believed that the unexplored parts of the ocean could contain much larger populations and different species than the world known today. Popularized by animations and movies, the myths of their nature have led to a misinformed public perception. Here is a more factual and intriguing look at nature’s most intelligent invertebrate. 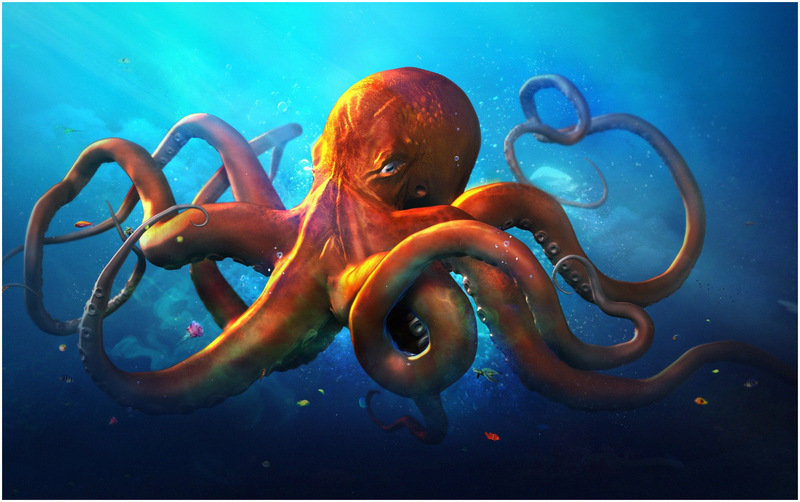 Octopuses are the main inspiration for mythological creatures, such as the Kraken and the Lusca. There is a stark physical similarity with villain characters in the modern media, such as comics, video games and animated movies that suggest inspiration from the same. Their blood is blue in color. Their blood evolved to be copper based rather than iron because of the protein hemocyanin. 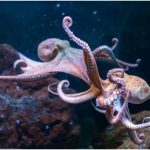 This protein helps improve the efficiency of oxygen transportation, especially in parts of the ocean with low temperatures where the oxygen levels are low. Their diet depends on the ocean type they occupy. 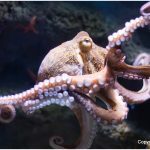 Those in the open ocean feed on prawns, fish, and other cephalopods. Those living at the bottom of the ocean tend to feed on crabs, molluscs like whelks and clams, and polychaete worms. 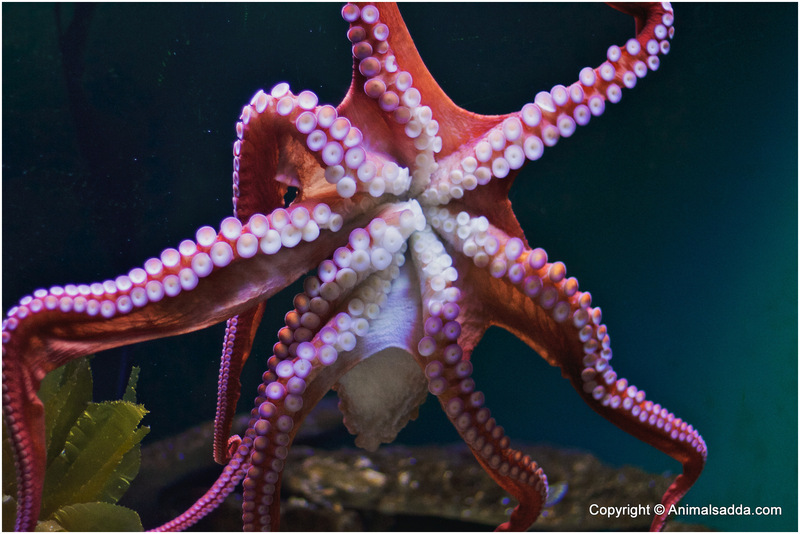 Young/ newly hatched octopuses feed on small creatures, like copepods, larval crabs, and sea stars. 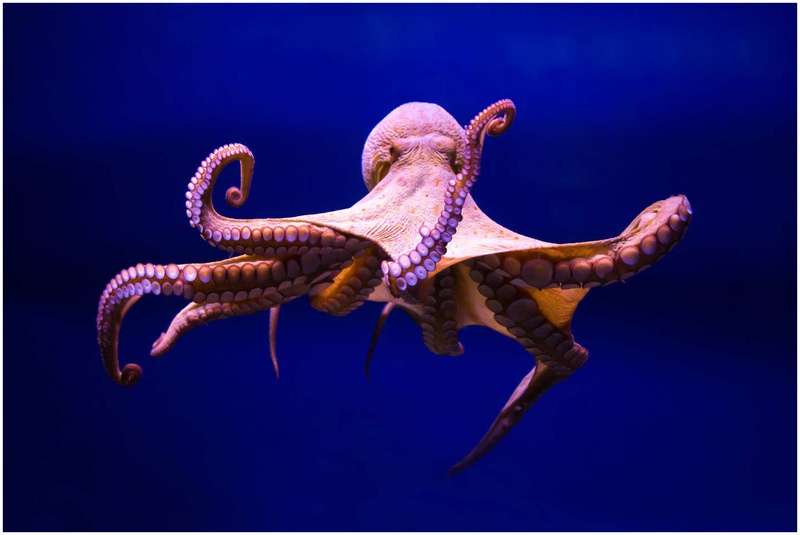 They catch their food using their tentacles and then inject ink using the beaks to deliver a paralyzing saliva. In the cases of animals with shells, they drill a hole in which they produce the paralyzing saliva. 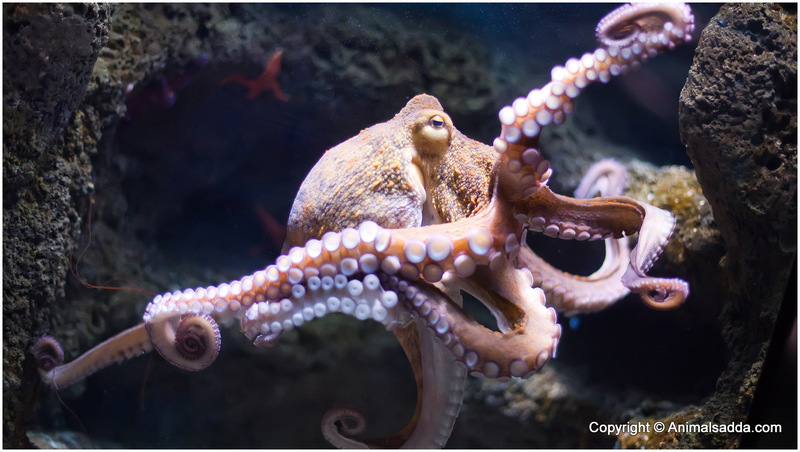 After the prey is immobile, the octopus begins to take it apart. There have been cases of large octopuses feeding on sharks and seabirds. They live in the ocean because they need the salty water to survive. Different species adapt to various parts of the sea. Coral reefs and crevices in rocks are some of the most common places to find them. They tend to camouflage in their surroundings, making them tough to identify. The don’t stay too long in one spot either; they tend to migrate every several days. 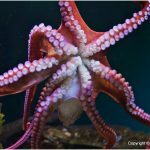 Their ability to survive at different temperatures may explain why the can be found in shallow water and the deeper parts of the ocean. Young octopuses are found near the surface. They tend to drift into deeper parts of the sea as they grow older. 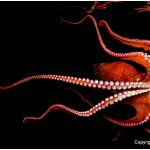 They are mostly solitary creatures though reports have demonstrated some few anomalies where groups of up to 40 octopuses live together. Perhaps the most exciting thing about their behavior is their hunting strategies. Some species chase their prey, some ambush their prey and others stalk their pray quietly until they can pounce on them. 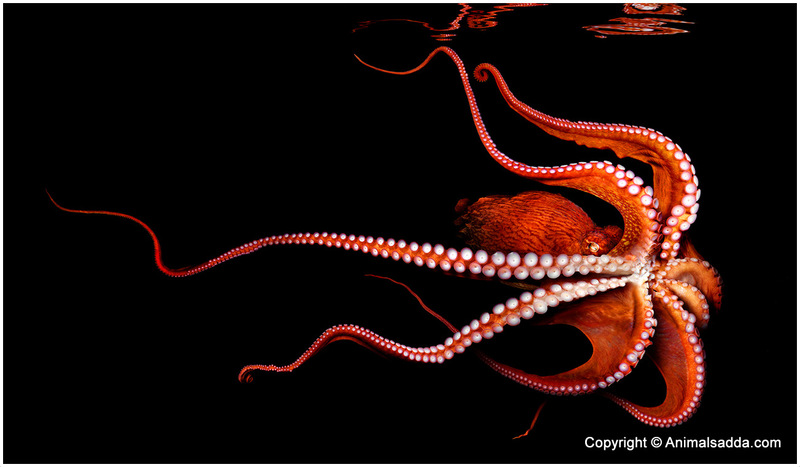 The Pacific Striped octopus surprisingly uses a more devious method to catch its clueless prey. It creeps up to the prey, taps it with one of its tentacles from the furthest side. 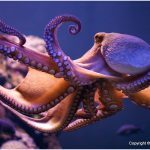 This gentle tapping from the most distant side triggers a flight response that sends the victim running into the octopus’ arms. Their pastoralist nature often leads to them taking refuge in strange objects, like submerged bottles. 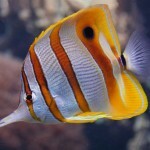 Some in captivity have been able to break out of complicated aquariums which proves how intelligent they are. 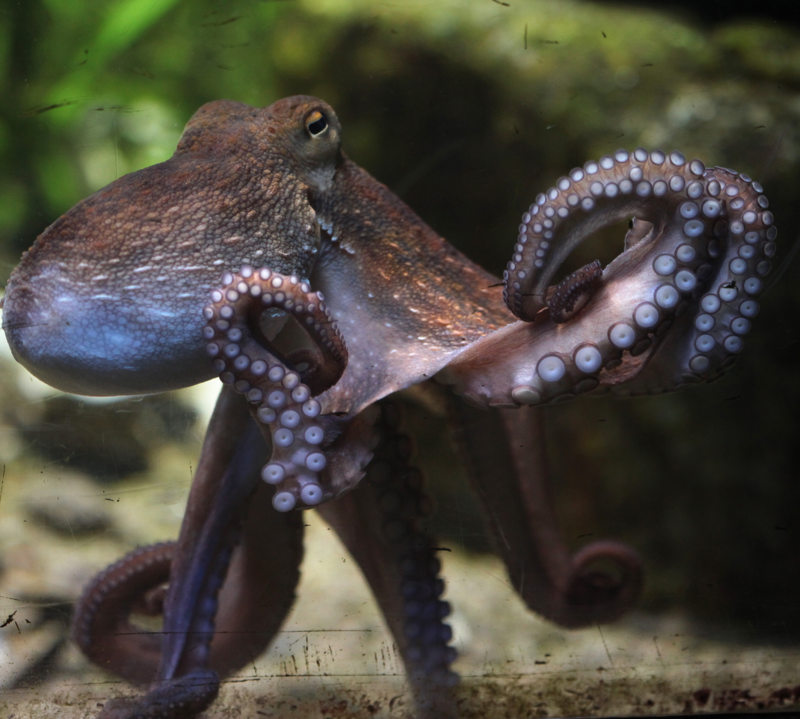 Octopuses fall prey to creatures like eels, dolphins, sharks and other large fishes. They are also a popular human delicacy in some parts of the world. 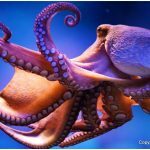 Research on octopuses is still in its infant stages and therefore makes it difficult to tell if they are endangered or what their estimated population is. As a defense, it can camouflage itself by manipulating its pigment cells and skin muscles to mimic the patterns, colors, and texture of its surroundings. Its body is also soft and boneless, allowing it to swim fast and hide in crevices and underneath rocks that its predators can’t get into. A more interesting escape mechanism is the release of a cloud of ink. This substance contains melanin as its main component and blurs the vision of pursuing predators as well as numbing their sense of smell. This is especially useful when dealing with predators like sharks that use smell to trace them. 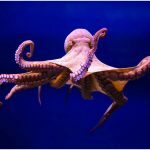 Some species of the octopus have the ability to accurately mimic more dangerous creatures like eels, lionfish and sea snakes. As a last resort, when captured, they can lose their arms in a similar way to how lizards lose their tails; they eventually grow back. 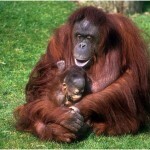 Both males and females have an instinctive drive to mate once the age of maturity is attained. One surprising fact is that after reproduction, both the female and male die through cellular suicide. 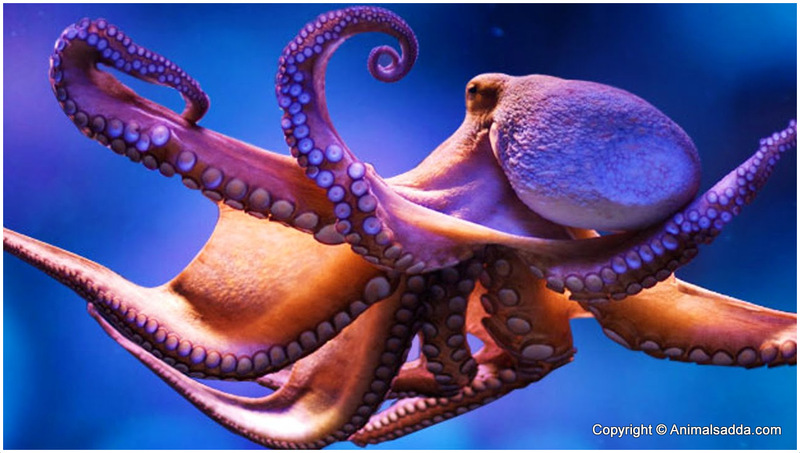 The male octopus uses one of its specialized tentacles to deliver the sperm to the female’s mantle cavity. Fertilization doesn’t happen immediately. Depending on the species in question, the female can store the sperm until the eggs mature and they find a den to lay the eggs. After fertilization, they can lay eggs ranging from hundreds to hundreds of thousands depending on the species in question. The female protects the eggs and cleans them by forcing water over them. This increases oxygen supply and prevents bacteria or any organisms from settling on the eggs. After the eggs hatch, the mothers die. They have 8 large tentacles and a large head-like structure. Their mouth is located under their tentacles. Most of the organs are inside their mantle. The eyes are somewhere in the middle of the sack-like structure that is referred to as their head. 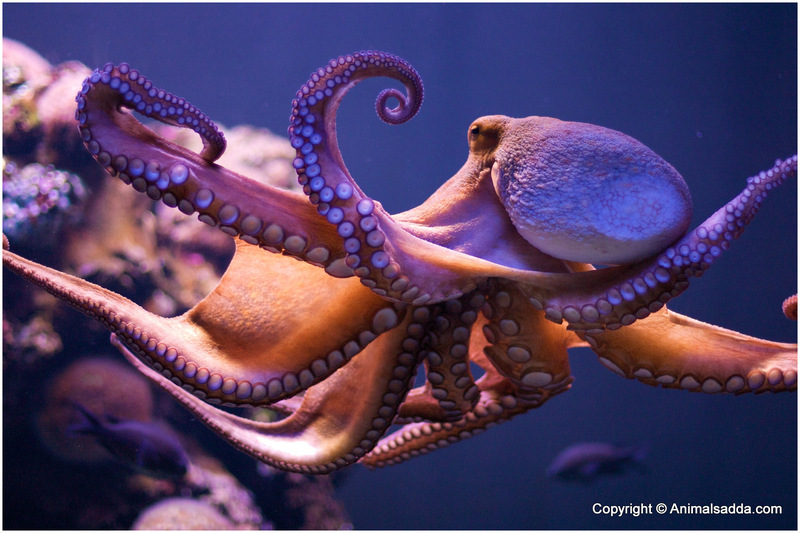 The underside of their tentacles has suction cups that are very sensitive to touch and taste. 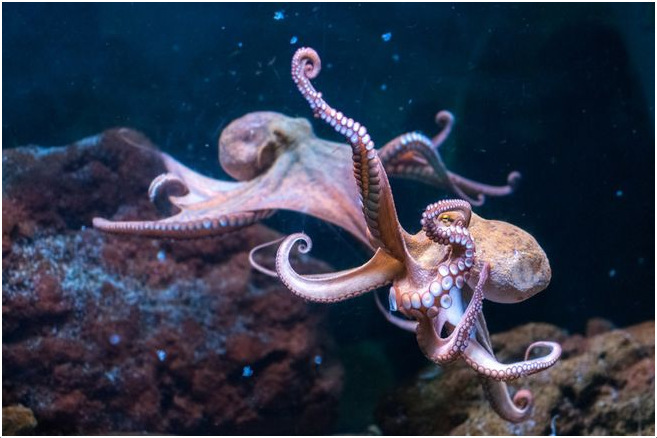 Their tentacles have more nerves than their brains do. One could argue that they have a mind of their own. This helps them understand their bearings and even find food. 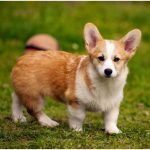 Their eyes are sensitive and can distinguish light variations and colors, but the creatures cannot form mental images in their minds. 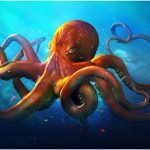 Their highly sensitive tentacles also help them figure out their bearings. They can survive in any part of the ocean irrespective of the temperature. 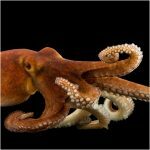 Octopuses have three hearts where two are branchial while one is systemic. The two branchial hearts pump blood to the gills while the systemic heart is responsible for pumping blood to the rest of the body. When they are swimming, the systemic heart stops pumping, thus making them tired quickly. This explains why they like to crawl. They have a lifespan of 1-3 years in the wild. Females may end up leaving longer as they brood over their eggs. 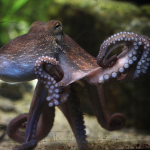 There is a record of a female octopus that watched over her eggs for 4 ½ years before dying. Their size varies with each species. Adults can weigh about 15 kg, but the largest one ever recorded weighed about 72 kg. Their arms can span about 4.3 m.